Part of the challenge of marketing is directing the budget to where you can get the best ROI. While I am not a fan of buying something that doesn’t represent your brand just because it’s cheap, that doesn’t mean you can’t buy strategically. These sale, clearance and budget branded products will help your marketing dollars go further. 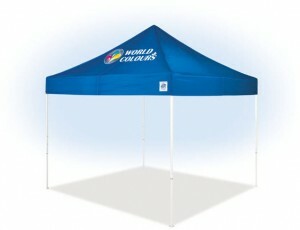 If you’re planning an outdoor event or need a portable trade show shelter, grab this limited-time markdown on a lightweight, portable and reliable pop up. Its’ cross truss design gives the shelter added strength and support for multiple uses. Show off your wares to your customers beneath the shade that attracts attention and shades you, too. On sale through 5/31/2012. This double-wall acrylic tumbler is a great all-purpose product. From welcoming a new employee to making a summer event even better, this tumbler’s subtle soda fountain look makes it memorable. 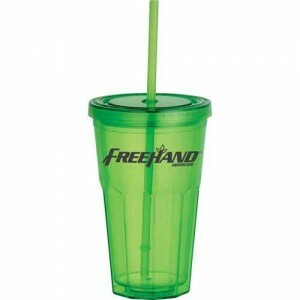 The product features an acrylic straw with stopper and ergonomic design on base for easy gripping. Product ships with matching color straw unless otherwise specified. BPA Free. On sale through 6/16/2012. 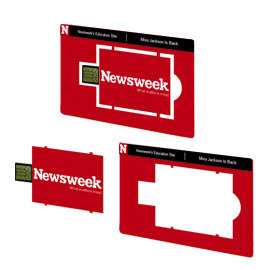 A great buy any time of the year, this full-color giveaway makes printed promotional materials interactive. The device is punched out and plugged into a USB port where it directs web browsers to your website or landing page. Full color printing inside and out. Excellent for pharmaceuticals, the automotive industry, schools, travel, corporate, real estate, retail or any use requiring printed information and a website link. On sale through May 31, 2012. Get ’em while they last! 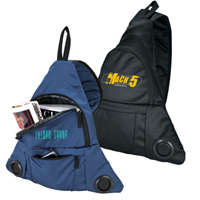 This unique sling backpack features integrated stereo speakers to turn any situation into a party. Compatible with almost any mobile device. Great for students! Zippered and padded main compartment with interior pocket, front zippered pocket with battery pack, MP3 hook-up and 2 accessory pouches, stereo speakers, carry handle and 37″ padded adjustable shoulder strap. (3 x AAA batteries not included) Clearance item, based on availability. We keep close tabs on what our suppliers are promoting and discounting. Send me an email with some details about what you need and we’ll find a way to make your marketing budget go further. on ouг ѕitе. Kеep up the gгеat wгiting.